On the afternoon of January 14, CCIEE Vice Chairman Wei Jianguo met with Chris Toth, President of the US Varian Oncology Systems. The two sides exchanged views on the impact of China-US trade frictions on Chinese and American companies. Zhang Yongjun, Deputy Chief Economist, Han Yihu, General Manager of the China Economic Consulting Corporation, and Xu Chaoyou, Director-General of the Department of External Affairs were also present at the meeting. Wei Jianguo affirmed the efforts made by Varian Medical Systems to promote the development of Chinese medicine continuously. He pointed out that the implementation of the “Healthy China” strategy, proposed by Chinese President Xi is aimed at improving national healthcare policies and providing Chinese people with comprehensive healthcare services. Hopefully, Varian Group will take this opportunity to strengthen cooperation with Chinese enterprises and related scientific research institutions in the field of medical and healthcare services. The current China-US trade frictions have brought difficulties to the enterprises of the two countries, but the two governments are actively looking for solutions. CCIEE has also been making efforts to promote the development of bilateral economic and trade relations between China and the US. For example, the “US-China CEO and Former Senior Officials’ Dialogue” co-hosted by CCIEE and the US Chamber of Commerce is an important platform for exchanges between Chinese and American companies. The Varian Medical Systems Group is more than welcome to participate in the event. Chris Toth briefly introduced the development of Varian Medical Systems in China since it entered the Chinese market 35 years ago. He noted that China is an important part of Varian’s global strategic planning and the China-US trade frictions will not hinder the Groups’ determination to develop in China. In the future, Varian will continue to invest and build factories in China, produce and assemble radiotherapy and chemotherapy equipment in China, bring advanced treatment and training of rehabilitation physicians to second- and third-tier cities in China, so as to benefit more cancer patients. At the same time, he hopes that the China-US economic and trade frictions can be properly resolved as soon as possible so that enterprises can focus on production. 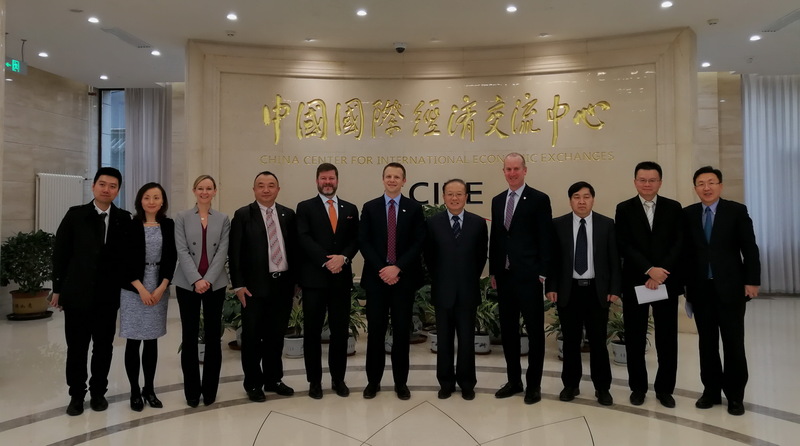 The Varian Group will continue to strengthen exchanges and cooperation with CCIEE.